I love what Emerson Made. EmersonMade started as a one woman operation in NYC where Emerson would sell her flowers, sometimes right off her lapel to other snappy dressers on the street! Here is Emerson whistling her way through the farmer's market. EmersonMade has bloomed into a full scale operation where she and her partner and the ArtistFlowerMakers build the blooms each season! Emerson's partner just happens to be her adorable husband Ryan, the Big R.
Each bloom they build is one of a kind, varied, and has its own unique character. They specialize in hand-dyed and hand-stitched blooms and accessories to accompany their growing apparel line. "In 2008 Emerson and Ryan left New York City for a farm with green pastures, this is where the EmersonMade Hens and Ducks reside also!" I adore her Ballet Dahlia clutch to tuck under my arm on special occasions. Each flower is packaged in a beautiful gold jewel box that makes the perfect gift. EmersonMade Friendship Carnations really work wonders in the "I Like You" department. Turn a special day into a special year with her glorious 5 inch Poppy and Happy Birthday Ribbon. Ungloom Marguerite Daisies are 100% linen and wool felt, hand stitched and bloomed by the EmersonMade FlowerMakers. With the help of her beloved photographer BigR, Emerson does all the styling, design, content, photographs, collages, and artwork associated with EmersonMade. Emerson and Ryan are fun, loving, creative, stylish and homemade. I love that! Ryan and Emerson moved from New York City to a seaside town in New Hampshire two years ago and what a home-sweet-home it is! "We have a lot of guns around, this one is a quick grab to protect the farm from any varmints." E.M.
"We had to completely renovate it - it was a shambles when we got it! We wanted it to feel open, relaxing and inviting. The type of place that immediately puts guests at ease. This is our library." E.M.
"Another view of the library! It is beautiful in there during the day because it is northern facing and gets no direct light. It glows with the reflection of the trees!" E.M. This is where we eat! We wanted to be able to eat dinner next to the fire. It's open to the kitchen since that is where we spend most of our time. The table and chairs are from our collecting excursions. We have those fold up chairs all over the house! If you want to have a party in the grass you can bring them outside! The chairs get around." E.M. I love the collection of ironstone in their farmhouse kitchen. "The fantastic sink was found on craigslist for a bargain price, and we had the butcher block built. We use it for all our food prep." E.M.
"We designed our pantry so that everything would be visible. We have mostly unrefined ingredients because we don’t eat sugar, flour and processed ingredients so we just line it all up in here and grab what we need." E.M.
"We had to tidy up that beside table! Usually it is piled sky high with too many books about health, gardening and new projects!" E.M. Laundry room sink and folding table. "That rooms gets lots of light! We got the sink from an old man who collected beautiful sinks in his barn way out in the woods!" E.M.
All photos courtesy of EmersonMade. House photos via Amy Azzarito at design*sponge. You can also visit with Emerson and get caught up on the latest entry in her journal here! So y'all come out and root for the team! These riders were just getting warmed up. I'm looking forward to bringing you photos from the jumping competition next Monday! The Mr. and I attended the World Equestrian Games on Sunday and it was just beautiful. I am talking 70 degrees and sunny! We were able to sit along side some of the USA dressage coaches during morning exercises. This is where we came to admire the grace & charm of one particular member of the team. Katherine Bateson-Chandler atop Nartan, her 15-year-old Dutch Warm blood gelding. I hear that it took this shy, horse-crazy girl a while to work up enough nerve to go to Olympian Robert Dover’s New Jersey farm in hopes of getting a job with him. 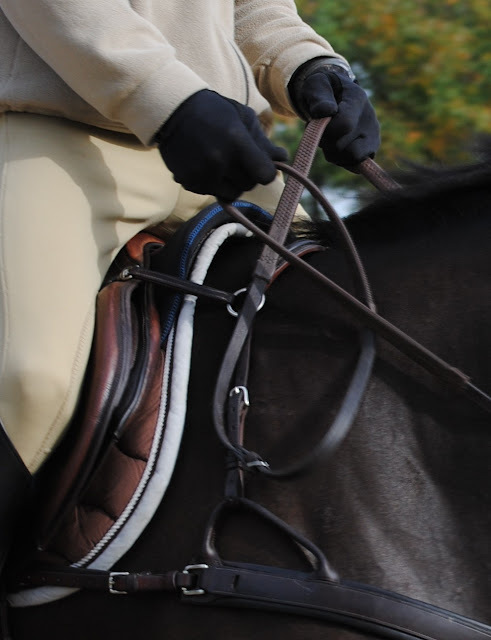 She was 16-years-old then and willing to do anything—anything at all—to work for the famous dressage rider. With determination, she arrived at the barn and left her phone number on the message board. When no one called her, she went back again, and again, until finally, her phone rang. The farm needed some weekend help mucking stalls and turning out horses. Knowing this was the chance of a lifetime, she agreed and the job was hers. 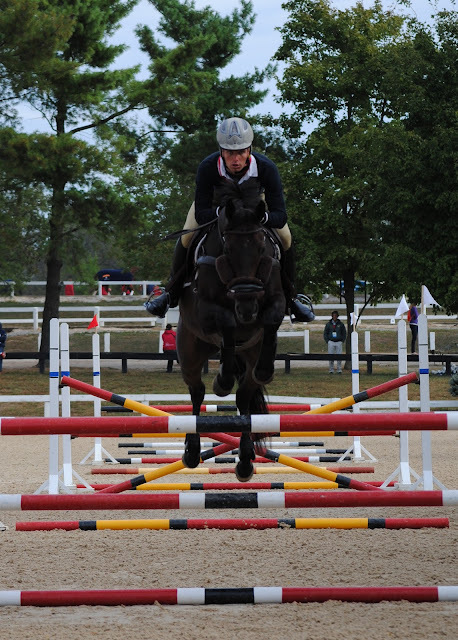 Through finding a mentor, and through her dedication to the sport, Katherine Bateson-Chandler has gone from a horse-crazy teen to an esteemed athlete riding Olympic veteran horses. Here she warms up under the watchful eye of coaches and her husband, Carl Chandler. Meet all the members of the 2010 WEG U.S. Dressage Team. Tina Konyot and Calecto V.
Our team represented the U.S. beautifully. The rain certainly did not dampen Katherine's style. I will be posting more inspiring stories over the next couple of weeks so I thought I would give you a few interesting facts. 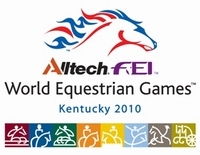 The Fédération Equestre Internationale (FEI) World Equestrian Games are the world championships for equestrianism. 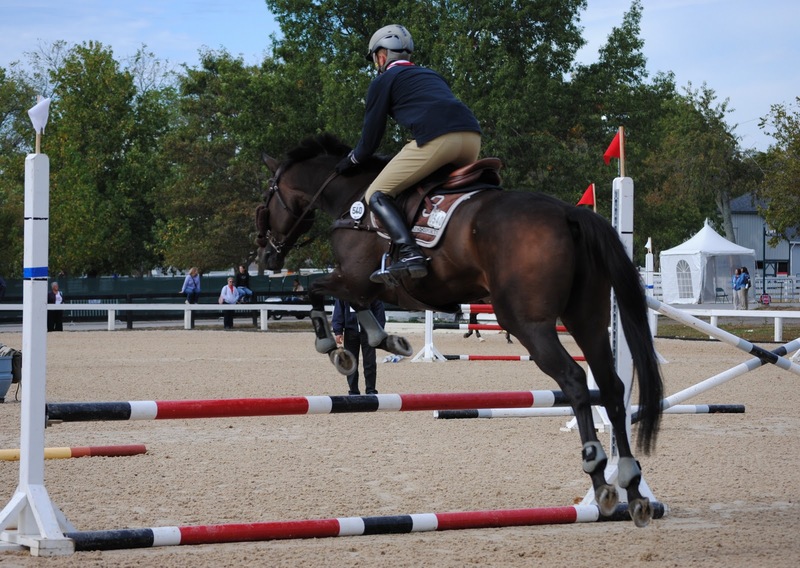 Lexington, Kentucky is very proud the be hosting the first WEG held outside of Europe! 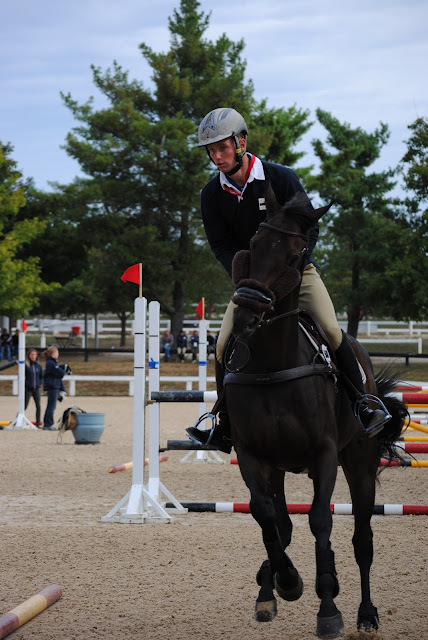 The world's top riders and most skilled horses competing at WEG go through a rigorous selection process during the 4 years preceding each competition. 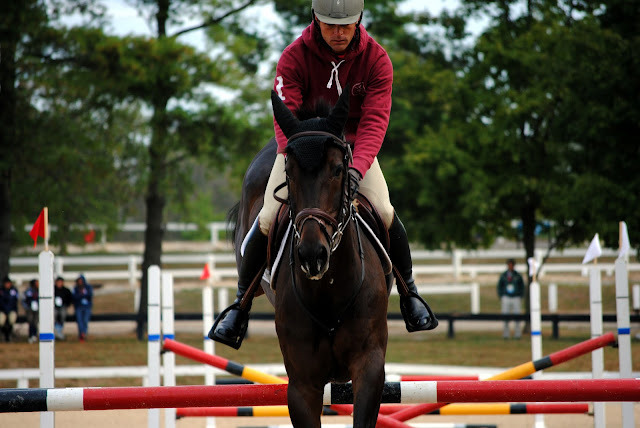 Each participating country sends teams composed of the very best equestrians in their discipline. Some 57 countries are represented by 800 athletes. Information and photos courtesy of Lisa Porter, Alltech FEI World Equestrian Games & Equestrian Magazine.